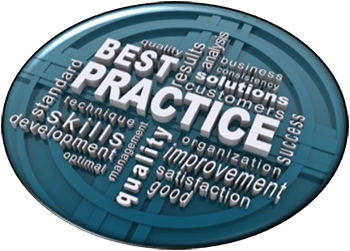 Following best practices for Lean Implementations will provide the greatest chance of success. But what are the best practices and the lessons learned from thousands and thousands of projects? There are many, but several core principals can be applied to your business. Classic LEAN teachings refer to seven different types of waste in manufacturing. These are overproduction, waiting, unneeded transportation and / or handling, excess processing, excess inventory, excess motion, and defects. These concepts can be applied to ANY LEAN effort, even if it is not in a manufacturing environment. In an office it might be how long a PO request sits in queue (physical or electronic) before being placed, or when an A/P person tries to match an invoice to a PO only to find the wrong quantity was received and signed for. Be creative with your thinking: you will find numerous items of waste in almost every system. Understand what parts of your process or system add value to the customer, and identify and eliminate those that don’t. Your customer will be the first to tell you what they will pay for, and what they won’t pay for if you listen carefully. But as you streamline your processes, you will add significant value to your internal operations as well. For example, a lean implementation for a large electronics manufacturer resulted in significant improvements in first pass yield, on-time delivery and overall throughput. You can see the results in our case study on Daktronics. Remember, everything you do in your LEAN project should ultimately benefit your customer. Elimination of waste can improve delivery, service, or even cost structures which could allow for price reductions while maintaining (or increasing) margins. Defect reductions will mean a higher probability that your customer won’t find defects. If your customer isn’t going to benefit, re-examine your targets. The best thing about a LEAN journey is it should be self-perpetuating. Once some successes are achieved and visible, sustaining improvement is an easy “sell” to team members. Creating an environment where everyone is on the lookout for improvement opportunities will naturally result in an engaged and thriving organization. Just do it! While guidelines, best practices and lessons learned give you the best chance at success, the best thing to do is to start. You can see many of these best practices in other blog articles here on our site. Even a modest LEAN project can yield an unexpected result, and the sooner you get one started the sooner you can reap the benefits. Don’t wait for perfection to start!